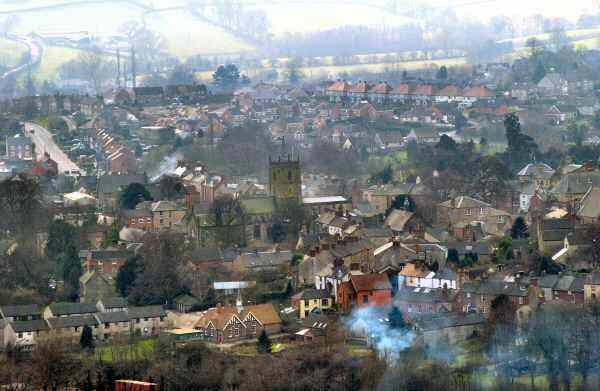 The small town of Wirksworth does not perhaps make much impact on the busy traveller driving through. All those visitors, however, with time to explore the narrow streets and maze of interesting alleyways, to admire the old buildings and lovely views, to visit the ancient church and the cathedral–like close, will soon find themselves falling in love with this fascinating old town. Standing as it does virtually at the centre of Derbyshire, about two miles to the south of the Peak District National Park boundary, Wirksworth was the centre of the English lead mining industry when it was at its height. 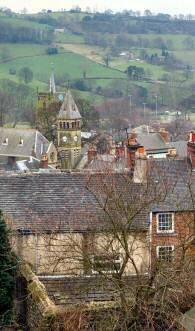 Lead was the basis of Wirksworth’s past prosperity and lead mining in the area goes back to at least Roman times. The Barmote Court was set up in 1288 to enforce lead mining laws, which it was said even at that time were of great antiquity. It is almost certainly the oldest industrial court in Britain, and possibly in the world; it still sits twice a year at Moot Hall in Chapel Lane. Between 1600 and 1780 lead mining reached a peak, before finally declining during the latter part of the 19th century. When miners were forced deeper and deeper for the ore, flooding problems became even more severe and made extraction uneconomic. The discovery of rich deposits of easily accessible lead ore at Broken Hill in Australia forced prices down even further, resulting in the closure of many mines. As lead mining declined, the limestone quarries provided work for people who lived in the area. The arrival of the railway in Wirksworth, in 1867, which linked the town with Derby and the rapidly expanding railway network beyond, opened the way for the easy distribution of limestone which was in great demand. The situation was improved still further 12 years later when a railway tunnel was built below the town centre linking Dale Quarry, known locally as the ‘Big Hole’ with the station. The great upheaval came in 1925--26 with the re-opening of Dale Quarry, when mechanisation was introduced and a stone crusher installed in a hole between two hundred and three hundred feet deep. Inevitably the whole of this densely populated area declined and the town was badly affected by dust, dirt and noise. Many of the people who could afford to do so reluctantly left, along with business and commerce. 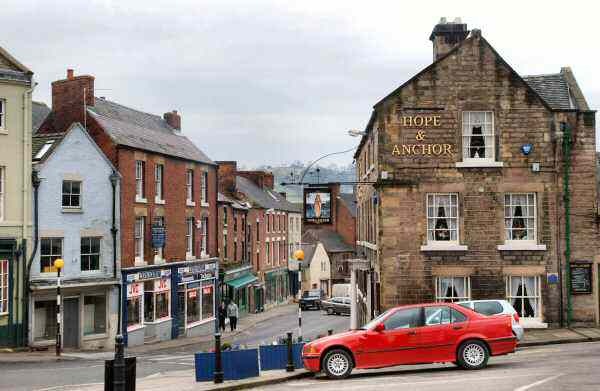 Buildings fell into disrepair, frequently being left empty to decay, and what had been one of Derbyshire’s most important towns was left blighted with the residents who remained despairing that improvements would ever take place. Help was at hand when Derbyshire Historic Buildings Trust discovered an anonymous charity, which after a lengthy process of selection and negotiation chose Wirksworth for financial support. In November 1978, a public meeting was called at Wirksworth Town Hall to discuss the proposals for the regeneration of the town. The meeting was overwhelmingly in favour of the proposals and the Wirksworth Project was launched. At first progress was slow, but after what seemed almost insurmountable problems were overcome, the realisation of the dramatic progress that had been made became fully apparent when national and international recognition was achieved. In June 1983, Wirksworth was presented with the prestigious Europa Nostra Award for architectural conservation. This was the only award made to a United Kingdom project at that time. It was given for its ‘exemplary regeneration of a small county town, through a broad programme of self-help and innovative features’. Praise came from many other quarters and HRH Prince Charles referred to the project as ‘brilliantly imaginative’. 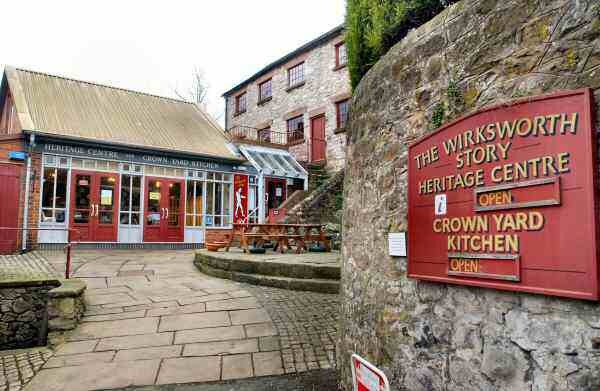 For those wanting to know more about Wirksworth a visit to the highly acclaimed Heritage Centre is essential. Situated just off the market place in Crown Yard, where Crown Yard Kitchen offers snacks and delicious home cooked meals. The Heritage Centre is housed in what once was a Silk and Velvet Mill where the ’Wirksworth Story’ is explained on three floors. This takes you on a fascinating journey through time from pre-historic days, when the bones of a Woolly Rhino were found, through the lead mining era to the present day. Excellent views over the town are obtained from the windows. The Parish Church of St Mary the Virgin stands on a site at the junction of at least five ancient trackways. It was one of the first centres of Christian teaching and may well have been built on the site of a prehistoric stone circle. The church dates back to about 653 and a path completely encircles the churchyard giving it a cathedral-like appearance. It contains the ‘Wirksworth Stone’ that has been described as ‘one of our greatest archaeological treasures’. Look out for the much admired carved figure of a leadminer with his pick and kibble on the west wall. On the Sunday following 8 September, the ancient custom of clypping is still observed, when the congregation join hands in thanksgiving to completely encircle the church. Adam Bede cottage stands at the southern end of Wirksworth, where Samuel Evans and his wife Elizabeth once lived and were portrayed as Adam Bede and Dinah Morris in George Eliot’s famous novel Adam Bede. George Eliot loosely based her novel ‘Mill on the Floss’ on Haarlem Mill that stands on the other side of the road from the cottage. The limestone cottages of The Dale and Green Hill cling to the hillside, as if Wirksworth was some little Cornish fishing village with nothing but the sea missing. In places it is possible to walk from the garden of one house onto the roof of another below. This is the area where the lead miners used to live, the jumble of small cottages having been built mostly of random stone extracted from nearby quarries. Nowhere is the lack of planning more apparent than in the area between the remains of Dale Quarry and Middle Peak Quarry, know locally as Puzzle Gardens. The cottages are linked by a maze of ‘ginnels’ or ‘jitties’, there is no room for vehicular access and it is a nightmare for any new postman. Halfway up Green Hill is Babington House, at one time used as a hospital, is an excellent example of the old builders’ rule, ‘Always use local products if they are available’ the builder having quarried the stone from the back garden. At the foot of Green Hill stands Hopkinson’s House, restored from dereliction by the ‘Wirksworth Project’. Wirksworth’s ancient market place occupies the centre of the town and it is surrounded by a remarkably large number of handsome buildings, which combine to make an impressive town centre. Little has changed over the last 150 years, apart from the construction of Harrison Drive, in 1940, to ease the flow of quarry traffic through the town. The facades of many of the shops and houses date from between 1760 and 1840, but the structures are often much older. A market is now held every Tuesday on the steeply sloping area at the foot of West End. It is very much reduced in size from 1306, when Edward I granted the town a market and four fairs per year. It is worth walking to the top of the market place to admire the view of the town and the hills beyond. This is Peak Practice Country, the town often having been used to shoot scenes from the ITV television programme. At the bottom of the market place set on an island site, is the Hope and Anchor, where the elaborately carved wooden fireplace in the lounge bar, probably dates back to about 1660. The Chemist’s Shop, established in 1756, has bow windows that are believed to belong to one of the oldest practising pharmacies in the country. The Red Lion is said to be haunted by the ghost of a coachman whose horses bolted while he was trying to manoeuvre his coach through the archway, losing his head in the process. The Old Lock Up, now a luxury Guest House, served as a police station for 100 years and DH Lawrence and his German born wife Frieda, listed as an alien, had to report there once a week during the First World War when they lived at Middleton-by-Wirksworth. In the 19th century, North End Mills along with four other mills in Wirksworth manufactured 800 miles of ‘Red Tape’ each week. Visitors to the mills can see hosiery being made at what has become one of the largest factory shops of its type in the United Kingdom. Every year at Spring Bank holiday, Wirksworth holds its annual Well Dressing ceremonies and carnival. In September the town celebrates the talents of local, national and international artists, along with performers of all descriptions, when it holds its prestigious annual festival. During the first weekend of the festival the Art and Architecture Trail takes place. When visitors can get a glimpse of properties not normally open to the public as well as viewing an array of contrasting exhibitions. 3. Heritage Centre and cafe. 5. Church of St Mary the Virgin. 11. The Hope and Anchor. 14. The Old Lock Up. The National Stone Centre: (Tel. 01629 824833) tells the story of stone, its geological and industrial history. The exhibition inside shows how advanced technology makes use of stone in an incredible number of ways. Outside the visitor centre, the quarry trail takes you back over three hundred million years. Open all year seven days a week. See special feature. North End Mills: (Tel. 01629 824731) one of the largest factory shops in the country which sells clothes for all the family. Visitors to the Mills can still see hosiery being made, have a coffee and admire the display of old photographs of Wirksworth. Open seven days a week. Crown Yard Kitchen: (Tel. 01629 822020) located next to the Heritage Centre. Please telephone for details or visit website. Seating outside. Art and craft displays. The Rising Sun, Middleton: (Tel. 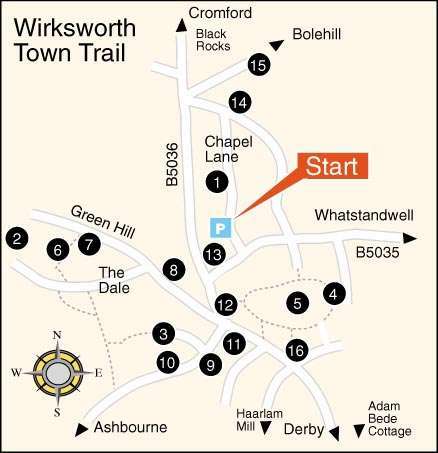 01629 822420) walkers and cyclists are very welcome at this popular pub within easy reach of the High Peak Trail. Open all day. Meals served at lunchtime and in the evenings during the summer. There is a beer garden and a secure lock up for cycles. Outstanding views and fascinating places to visit, this walk reveals much of the heritage of the area and the industrial landscape. From Black Rocks you climb steadily up the High Peak Trail passing Steeple Grange Light Railway and the National Stone Centre on the way to Middleton Top, where the Engine House contains a beam engine once used to raise and lower wagons up the incline. After leaving the trail the route soon drops to follow the perimeter of the quarry road before descending to follow a fenced path through a shallow part of the quarry. Soon you will see the houses that survived the ‘Big Hole’ quarry excavations, many others having long since disappeared from sight. 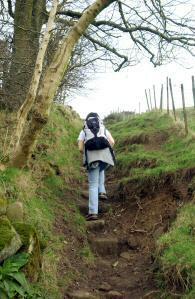 A feature of this part of the walk, are the marvellous views over Wirksworth and beyond. For more information on this fascinating walk click the link below. Based at the immaculately re-furbished Wirksworth Railway Station. There is an attractive visitor centre and shop, where refreshments are available. The centre also provides information on the project to re-open the line to Duffield, together with other facilities. Normally open every day from 10am to 4pm. (Tel. 01629 823076). See special feature. What's New, What's Coming and What's On. All details on this page were correct at the time of publication, but changes may be made without notification.